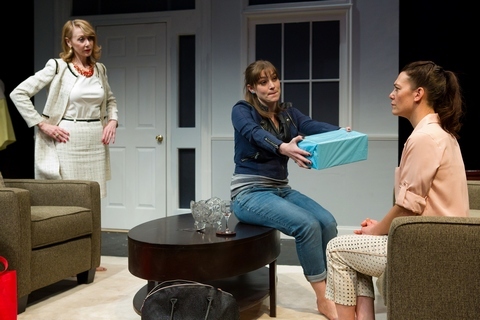 Victor L. Cahn’s “caper for three women” is part heist, part comedy, and all in good fun. What would you do if a random woman arrived at your door, invited herself inside your home, and started asking you probing questions? Would you let her stay or reflexively boot her out? In Villainous Company, Victor L. Cahn’s new play currently appearing Off-Broadway at the Clurman Theatre, the protagonist Claire makes the strange decision to indulge her mysterious visitor’s inquiries; the result is a mostly interesting, slightly confusing “caper for three women” that is part heist, part comedy, and all in good fun. Set in a fancy living room with curious decorations (craftily curated by set designer Jennifer Varbalow), Villainous Company follows three ladies in a game of cat-and-mouse (or cat-and-mouse-and-cat, as the case may be) where the roles of predator and prey switch by the minute. After an afternoon of shopping, the supposedly retired bookkeeper Claire returns home to discover she is missing one of her recently purchased packages. The conspicuously diligent cashier Tracy promptly arrives at Claire’s door to deliver the forgotten item and to casually introduce herself. As the two continue talking, Tracy’s ulterior motives become clear; by the time Claire’s friend Joanna stops by the house, the afternoon of civility has already devolved into an evening of deceit. While almost entirely enjoyable and engaging, Cahn’s script falters in a few respects. Namely, his story builds in fits and starts rather than steadily; despite its brief 100 minute run-time, the script frequently gets held up by its circular dialogue and fails to clip along briskly. Additionally, Cahn uses “subtext”—a dramatic device that contrasts characters’ illicit intentions against their spoken lines—to his plot’s detriment; the fact that his characters play their hands carefully affords the show a heightened level of suspense, but the playwright leaves too many dramatic questions unanswered for too long. Cahn thrusts his audience into a [frankly gratuitous] ten minute-long act break with almost no concrete information. Similarly, director Eric Parness’ treatment is sturdy, if somewhat stagnant. To his credit, he keeps his direction simple and straightforward, allowing the text to propel the story; however, the result is extended stretches of stillness. Parness’ inconspicuous staging is a mixed bag of captivating highs and unwelcomed lulls. Likewise, Joseph Travers’ safe but sterile fight choreography unnecessarily softens many of the script’s most intense moments. Conversely, this production’s “company” are just as “villainous” as the title suggests. Sharing the limelight fairly equally are Corey Tazmania and Alice Bahlke as Claire and Tracy, respectively. While Tazmania’s feigned ignorance and innocent smile easily win her audience’s attention, Bahlke’s blue-collar demeanor and sharp tongue provide the perfect counterpoint. Joining the party for Act II is Julia Campanelli whose poised and polished Joanna proves to be the play’s most intimidating presence. Asking us to stoop down to the level of three women willing to do many ethically reprehensible acts in the pursuit of wealth, Cahn challenges the notions of playing fair and working hard. Who would you throw under the proverbial bus in order to protect your livelihood? Is it ever justifiable to fight crime with more crime? 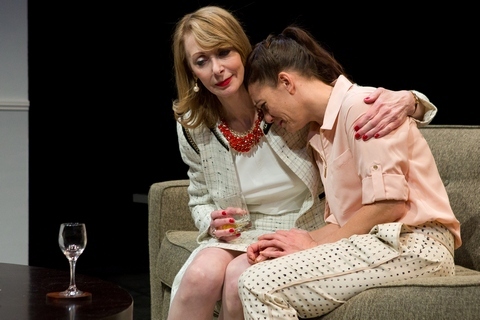 Villainous Company raises these questions and more in the form of a short, fun play that is worth a watch but ultimately not worth too much thought. In something akin to a lecture, this talky but intelligent one-man show steeps us in the religious philosophy of the noted Anglican philosopher. There is no diorama but there is an igloo, two women, three men and the problems involved in match ups.